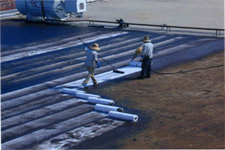 ProductsProducts FLUID APPLIED REINFORCED ROOFING More…BENEFITS Energy Saving Reflective Surfacing – Cool Roofs Water Based Systems Seamless, Tough, Flexible Economical Manufacturer’s Warranties U.L. Ratings 25+ Year Track Record Recover – No Need for Tear Off Polyester Reinforced Lasts Longer than the Original Roof and is Upgradeable Can be Applied over: BUR, Modified Bitumen, Single Ply, Metal Roofingand Gravel More…VALUE Low installation cost… No dump fees and less laborthan other types of roofing. Most of your dollar pays for the roof membrane, not expensive labor. No need to tear off your old roof exposing the interior of your building to damage from weather and debris. No hot asphalt – No flames – No fumes Little or no disturbance of building occupants. Application is quieter with no heavy equipment. The smooth, seamless roof system is easily maintained. There is no gravel or granules to hide the roof surface. Saves money because the roof systme is surfaced with an energy saving reflective coating which can: Reduce Cooling costs in air conditioned buildings. Greatly prolong thel ife of the Roofing System. Keep non a/c building interior cooler & more comforable for workers. Most Systems meet California Title 24 Requirements. San Joaquin, Sacramento, and Calaveras Counties for over 25 years.